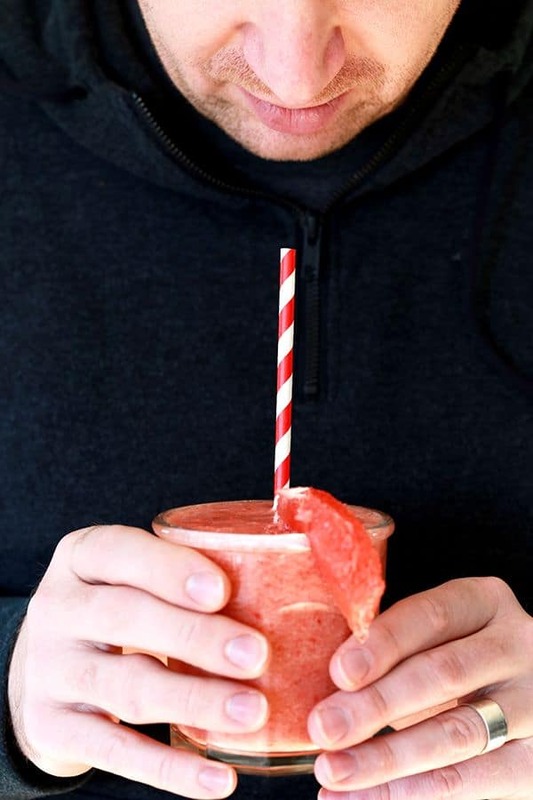 This four ingredient Strawberry Grapefruit Smoothie couldn’t be easier! 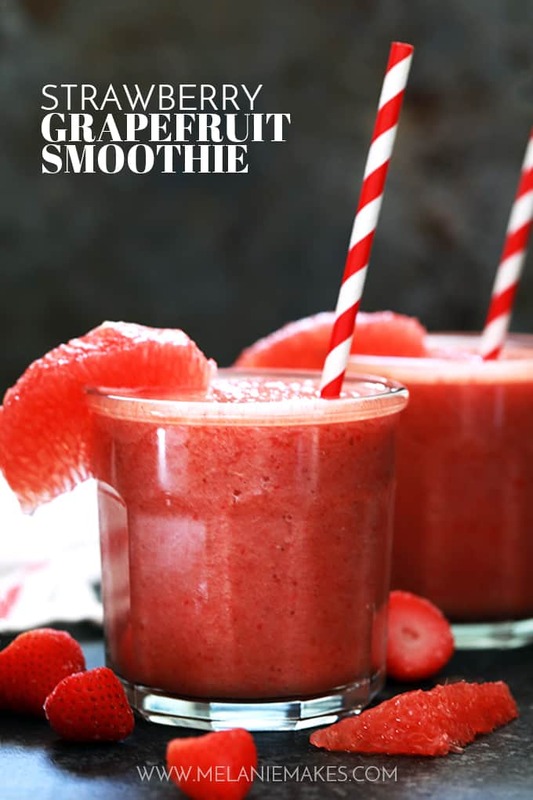 A ruby red grapefruit, strawberries, banana and orange juice are blended together in just seconds to create the perfect easy breakfast or snack. Hands down my most favorite smoothie and the perfect choice for breakfast, lunch or anytime in between. 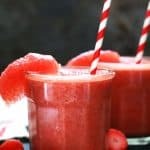 Every member of our family enjoys this Strawberry Grapefruit Smoothie and it couldn’t be easier. You’ll never find a prettier – or more refreshing! – smoothie. I find it hard to share this one and usually drink the entire contents of the blender carafe myself! I seem to have a thing with grapefruit as they’re also the star ingredient in my Grapefruit Mojitos and Honey Roasted Grapefruit Parfait Popsicles. You can’t tell they’re my favorite or anything, right? A great blender is key to a perfectly blended smoothie! I use my Vitamix and after trimming my grapefruit, simply toss it in the blender whole and let it do the hard work. I also prefer to use a frozen banana to ensure that my smoothie stays super cold for as long as possible. Sometimes this means I add an additional splash of orange juice to get the consistency I’m looking for. 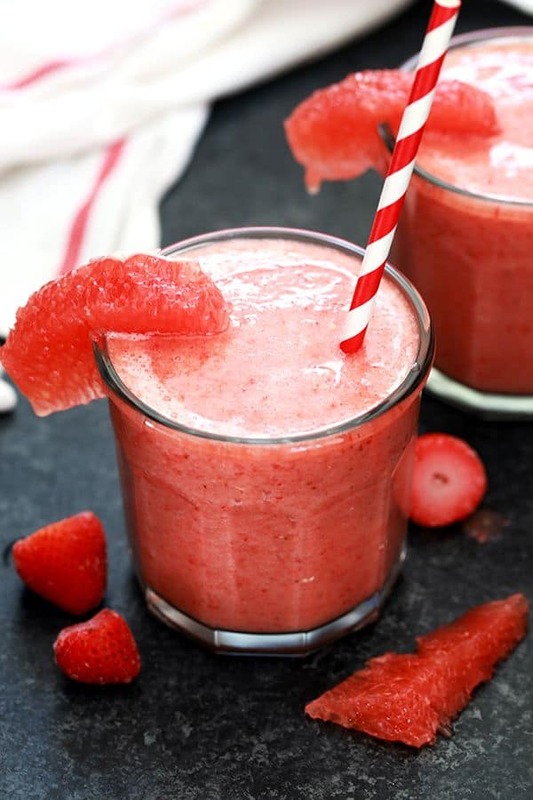 Another perk to this delicious Strawberry Grapefruit Smoothie? It’s easy to customize and completely make it your own! Chia seeds, protein powder and flax seeds as well as the occasional frozen kale leaf make their way into this smoothie when I’m feeling creative and looking to add even more good stuff to my breakfast. Looking to explore more new smoothie recipes? I have this Tart Cherry Smoothie, Peach Green Tea Smoothie and Orange Pineapple Smoothie on my list to try soon! Cut the ends off the grapefruit so you can see the pink flesh. Using that as a guide trim away the skin and the white pith until you have just the grapefruit flesh remaining. Place grapefruit and all other ingredients in blender and process until smooth. I really love the flavor combinations! I just happen to have a lot of strawberries to use up! Oh goodness. It seems as though I can actually smell those strawberries through the computer. I’m buying strawberries the next time. 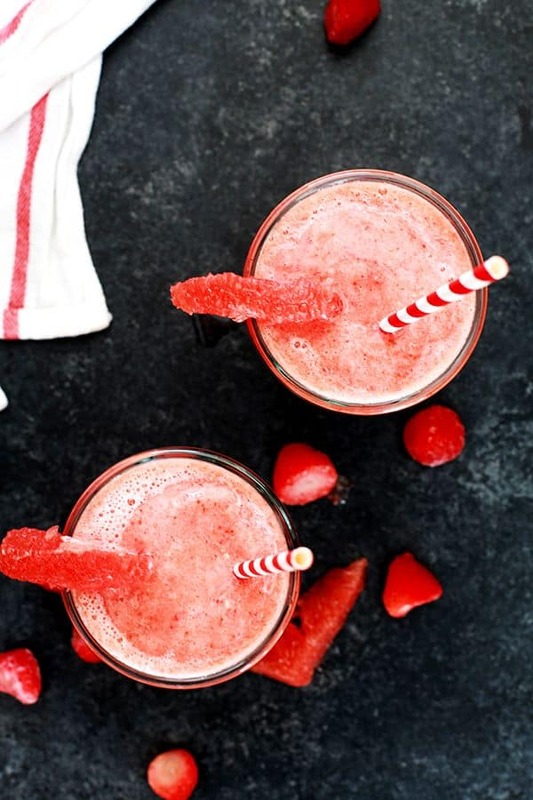 I always keep a big bag of frozen strawberries on hand just for this smoothie! Oh yum, I love grapefruit and have never tried the strawberry-grapefruit combo, this needs to happen pronto! Hope you'll give it a try, Kimberly! All these flavors together sound great! Can't wait to try! I have never had these two flavors combined. However, I think I am now going to try this and fall in love. Can't wait to hear what you think, Jacque! I have a container of pink grapefruit section. I'm on this!! okay, just made this with grapefruit sections + juice and two naval oranges. Yum! I need to buy strawberries and try it again. So many possibilities! This is definitely one of our favorites, Leslie! What Mara said... ;) Send it to Minnesota woman! YUM! oh yum. if you feel like whipping one up and sending it to chicago, i won't be upset :).